During the last couple of weeks the second board has had scenics mostly completed. This is basically a simple board with the tracks running across, but with an added single track right angled crossing (non-operational). This will be controlled by a tower (not the one in the picture). Code 55 track has been used for the main pieces, with code 40 rail used to suggest a proper crossing. The main scenic feature on the board will be an interstate freeway overpass (just the pillars are shown in the photo below. 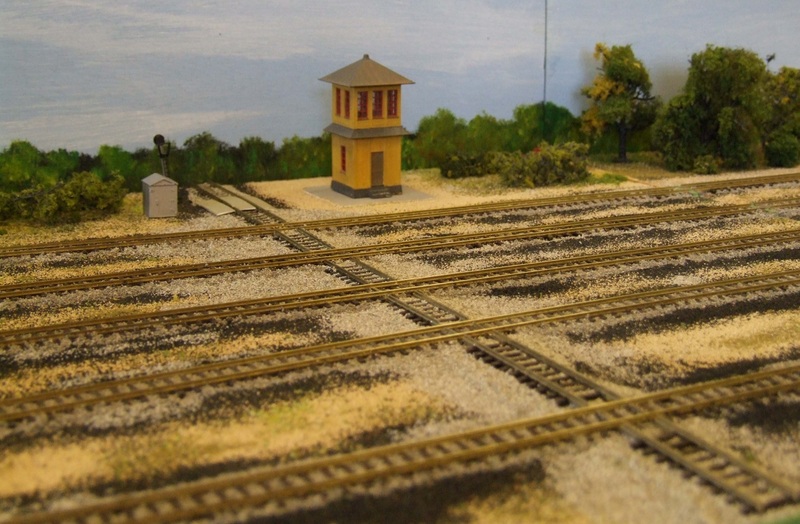 Having done the preparatory work at a previous meeting, the scenics were added to one of the endboards at the latest meeting. Sculptamold had been applied to give some indication of height variations, and these parts were painted brown to give a dark colour under the scenic scatter in case of chips…. (I always forget that it would be better to add some brown poster paint into the sculptamold mix before applying!!). Having done this all areas were covered in glue and then a variety of scatter material was applied. Several layers of varnish were added to what will become a pong, though this needs more coats plus reeds etc. added. Similarly bushes etc. will be added later. 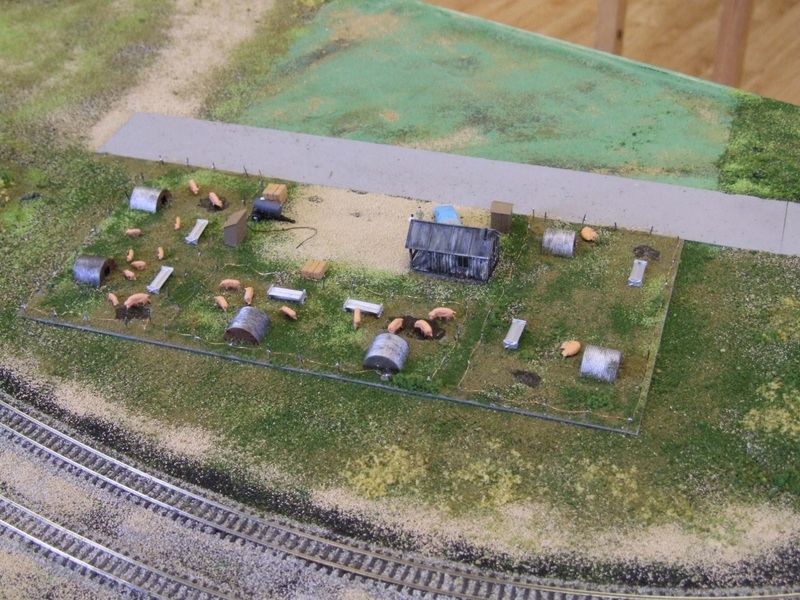 As the endboards will be transported face to face, any bits over 10mm high have to be removable, so the farm buildings and a pig farm have been built on ‘slot-in’ scenic boards. The completed pig farm can be seen in the photo below. 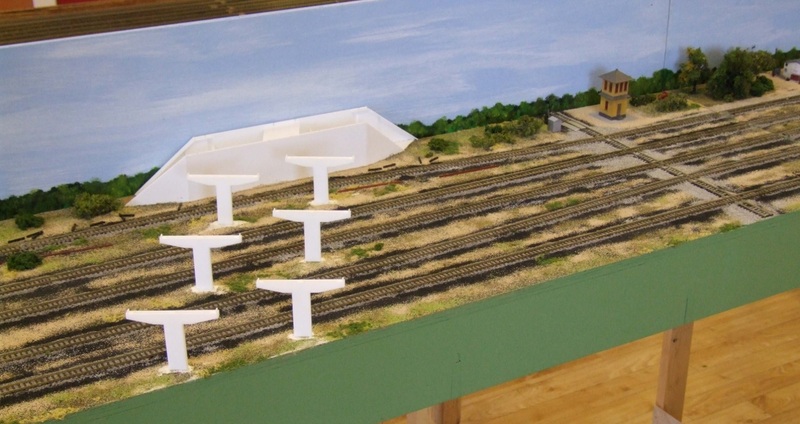 Hopefully the ‘bottling plant end’ can be similarly finished at the next meeting, and then the scenic boards can then be looked at as a whole and have the rest of the scenic detail added.